For the most part, I don’t really mind being Gluten Free. When I was first diagnosed as having a gluten intolerance, it was tough. I had never even heard of gluten and didn’t understand why I couldn’t enjoy my favorite products. I used to make a 45 minute drive to a specialty grocery store, once a week, called Stella Lucy, which sold only gluten free products. It was really nice to have a safe place I could find food, but it was also super inconvenient and expensive! I was only a year out of college, financially independent for the first time and frustrated I’d had to spend a good chunk of my income on groceries. It was also very new to me. I was able to eliminate the obvious items like bread and pasta and find gluten free alternatives, but it took quite some time for me to learn how many products contain small traces of Gluten and discover how it was hiding in foods. I learned to read labels and slowly, started to find items I enjoyed. Fast forward a few years and gluten free products are everywhere! I can’t step into a grocery store without finding a gluten free product and many stores have a whole gluten free section. With a little practice and knowledge, it’s super easy to stay gluten free without feeling deprived. In addition, many restaraunts make it easy to identify if gluten lurks in dishes and offer a gluten free menu or at least a few options to select from. One thing I do miss, is good Chinese food!! Chinese food has always been one of my favorite cuisines, but many sauces contain flour and other sources of gluten, making them a memory of the past for me. Typically, when we dine at a Chinese restaurant as a family, I order steamed shrimp with vegetables. Boring! (I do have to admit – I actually love shrimp and veggies). 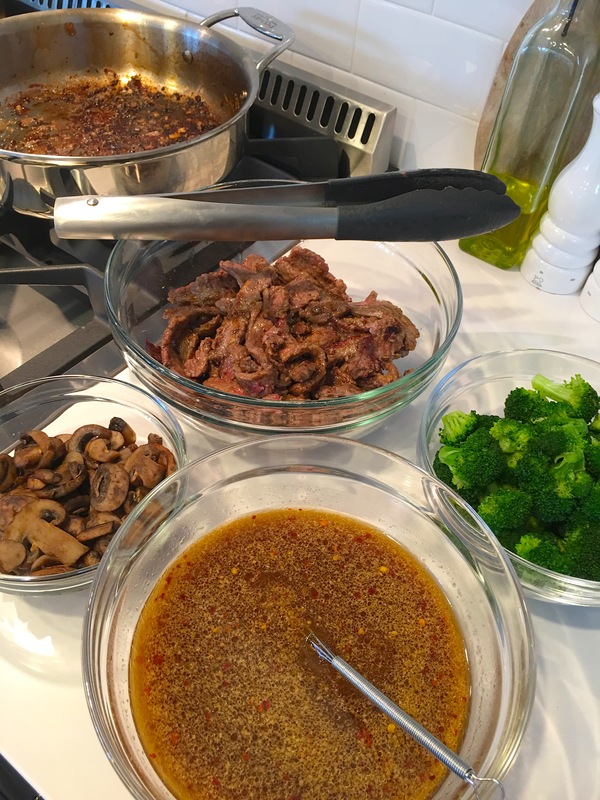 Lately, I’ve been craving a childhood favorite – beef and broccoli and I knew the only way I’d enjoy the dish would be to make some myself, so I turned to the web on a hunt for a dish that was gluten free and wasn’t loaded with sugar. I was so excited when I found this Lighter Beef & Broccoli recipe on Iowa Girl Eats. Not only is it delicious, but it was so simple! Since her recipes are gluten free and tasty, I will definitely be returning! I’m almost embarrassed to admit this, but pre-baby I avoided recipes that required me to touch and cut up raw meat. It grossed me out. However, since becoming a Mom my gross out limit has increased exponentially. Being a parent really does change your perspective on so many things and it didn’t stop in the kitchen for me. 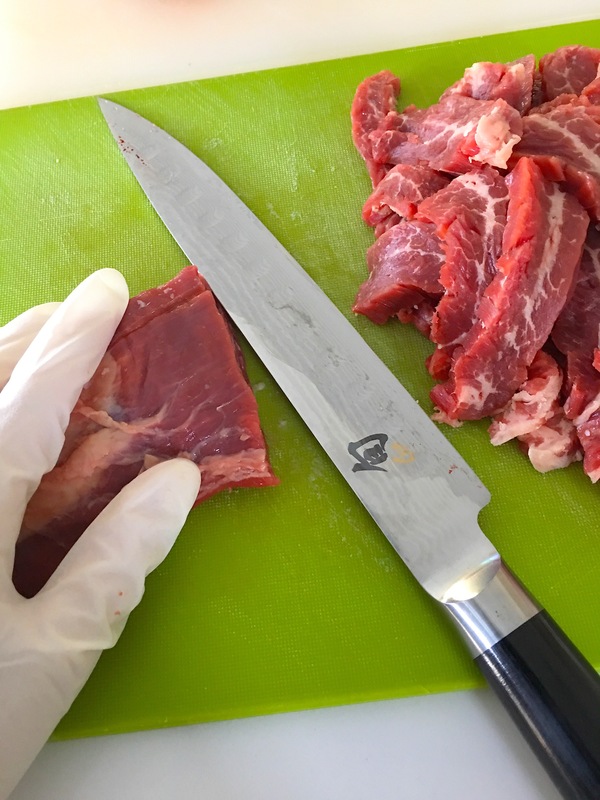 A Mom hack I use is to use disposable gloves when handling raw meat. It seems the second I open a package of raw meat, Ryder needs help or takes a tumble. The gloves make it easy to just pop off and tend to him quickly. I substituted the Tamari sauce with coconut amigos just to cut down on the sodium a little more. 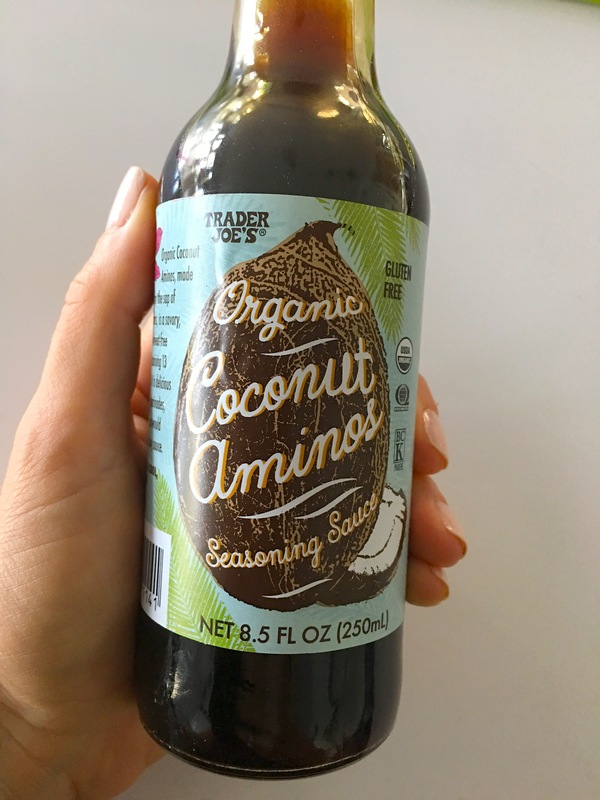 I love Trader Joe’s coconut aminos. I use them as a substitute anytime I would use gluten free Tamari or soy sauce. 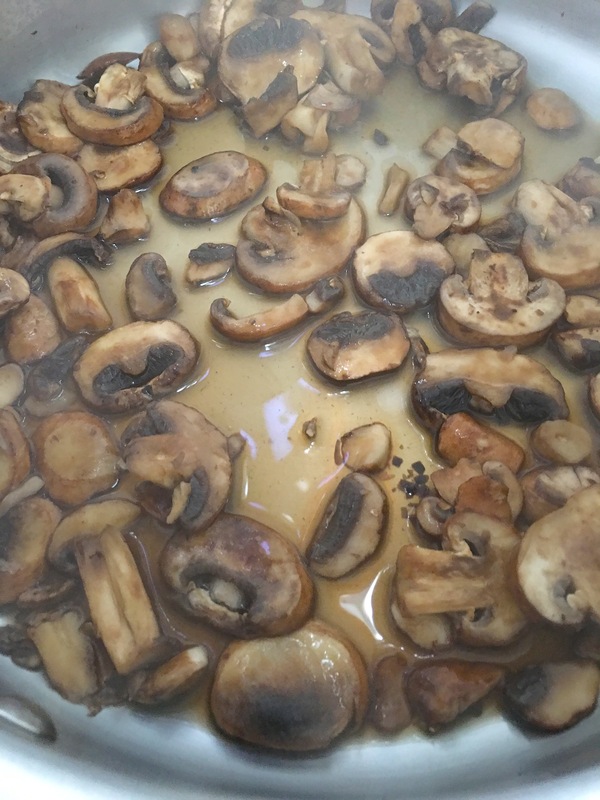 I also added steamed sliced mushrooms to the mix. I love mushrooms and it was the perfect addition to this dish. Ryder did not agree. Additionally, Ryder is a fan of broccoli and prefers his extra soft, so I steamed the broccoli a few minutes longer. Also, I only used half of the olive oil. It was so flavorful and the marbled fat from the beef kept it from drying out while cooking. It turned out so delicious. Another great thing about this dish, is it only requires one pan. Thats always a big win in my book. 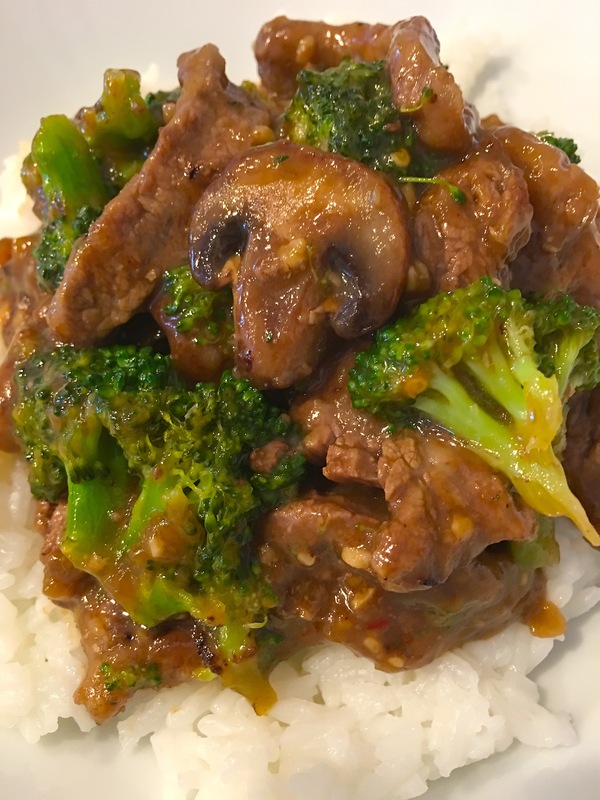 This dish cooks fast so you’ll want to have rice cooker going, the sauce prepared and broccoli and mushrooms steamed in advance of cooking the beef. After all the beef has been cooked, pour everything (except the rice) back into the pan and ta – da – dinner is served! Slice flank steak against the grain to create thin, equal-sized slices. Add sliced steak to a large zip lock bag and add 2 Tablespoon coconut aminos. Squish to coat the meat with coconut aminos and then sprinkle 1 Tablespoon GF flour and squish again. Put bag to the side and whisk together the sauce: coconut aminos, gluten free flour, chicken broth, brown sugar, rice vinegar, sesame oil, prepared garlic, ground ginger, and red chili pepper flakes and set aside. Heat a large sauté pan over medium-high heat then add 1/2 Tablespoon olive oil and half of the marinated steak. Cook for 1-1/2 minutes and flip for an additional minute. Remove to plate and repeat with remaining olive oil and beef. 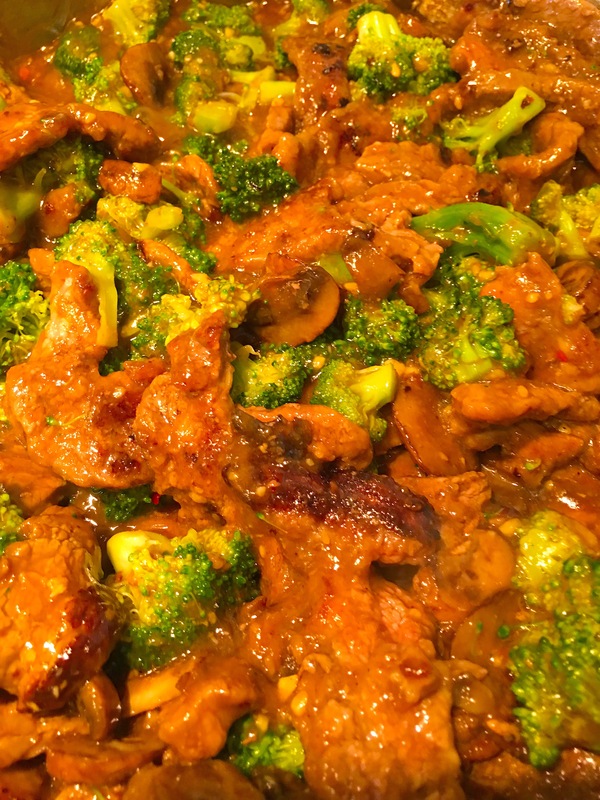 After all beef is cooked, add the sauce, broccoli and mushrooms and simmer for 2 – 3 minutes.